A few weekends ago we had friends over for brunch. 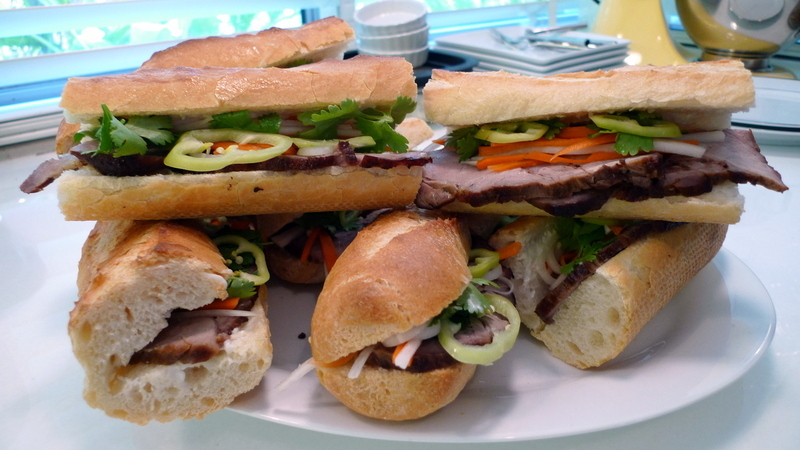 I had slow-roasted a pork shoulder and thought it might be nice to thinly slice the meat and make Bánh Mi, the Vietnamese style sandwiches, as a main course. Appetizer: cubes of fresh mango (so sweet this time of year! 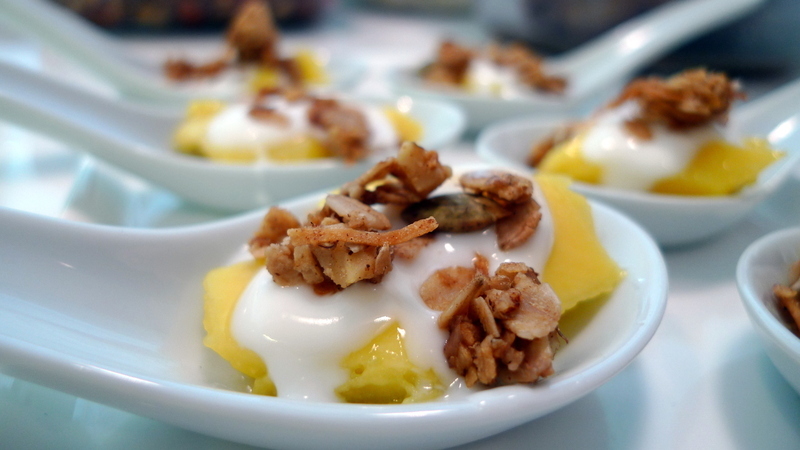 ), drizzled with plain yogurt and sprinkled with some homemade granola. Homemade Bánh Mi: Baugettes from Le Blanc bakery on Sukhumvit Soi 39 with sliced roasted pork shoulder, corriander, mayonnaise, pickled carrots and daikon radish, hot peppers, and a splash of fish sauce. In this initial round, I didn’t add enough pickles. The next evening I made another batch, this time with more pickles, and the results were much closer to authentic. Fresh papaya and watermelon for dessert. And a loaf of homemade banana bread, served with some whipped cream cheese and butter. This entry was posted in Uncategorized and tagged BánhMi, Brunch, cooking, food, sandwiches by christao408. Bookmark the permalink. Beautiful presentation of delicious food. 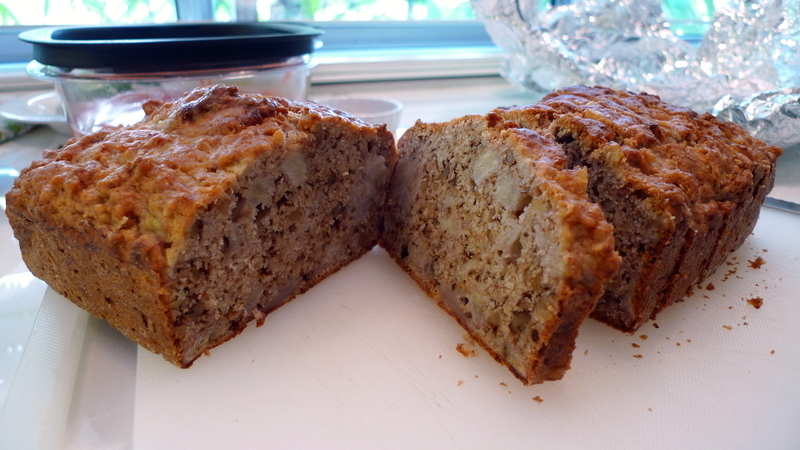 Banana bread with cream cheese –Yummy!! your picture of the sandwiches made me get one myself. Yum! I’m going back home for Easter break and the first thing I am going to do is go get banh mi with family. Oh goodness, I’m so hungry now!! I think it all looked tasty BUT I am drooling over the mango appetizer and the papaya & watermelon. I’ve been craving good fruit. We are between seasons and all they have are last year’s apples and overpriced berries and bananas. I can’t wait for the plums, peaches, nectarines and apricots! looks delicious! mmm… i miss fresh mango, haven’t had that in a long time. like val, i definitely can’t wait for the first crop of local fresh fruits to arrive! Omg, that all looks delish, especially the banh mi’s and banana breadddd. What do you use to pickle the veggies in the banh mi? Is it just vinegar and sugar? BANH MIIIIIIIIII and PAPAYAAAAAAAAAAAAA HEAVEN!! I love fresh fruit. We get papaya here but it’s not that good. -love the pictures. @CurryPuffy – Oh, I’d imagine you have no shortage of good Banh Mi places in LA, right? Especially down in Westminster. @wretched_epiphany – I’m jealous – you are at the source! 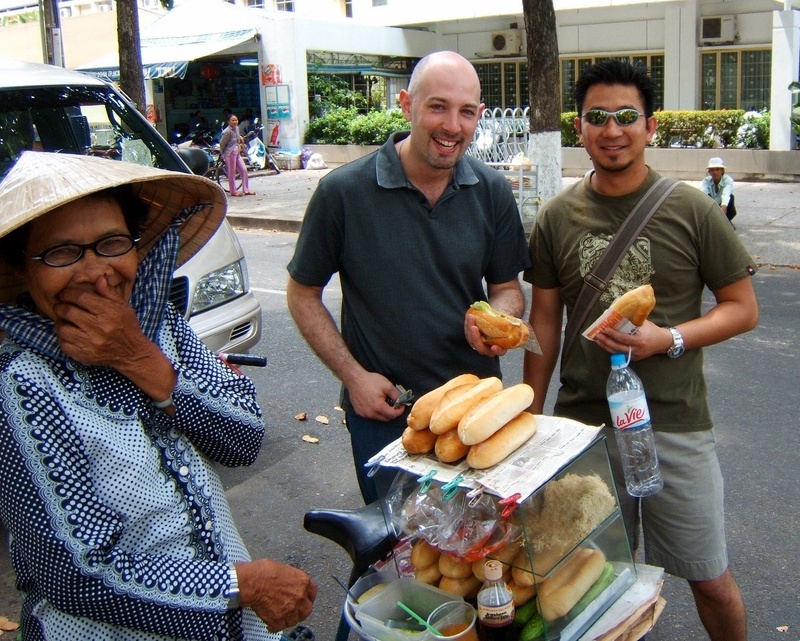 There is this fantastic picture of me and my high school friend Ryan in Ho Chi Minh City in February 2006, buying banh mi from this old lady. We each ate one apiece and afterwards she said, in halting English, that it would make her very happy if we bought another one. Who could resist that? @hilabpartnerxD – Yes, just a simple sugar and vinegar mixture left to sit a few hours. @kunhuo42 – @murisopsis – When I’m back in the US in May and June I sure hope the stone fruits are ripe and ready! @Devilzgaysianboi – I’d be honored to be in charge of the food at your wedding! @sassyjessie – Motivational entry, huh? =)@aftershejumped – Sounds like a plan! 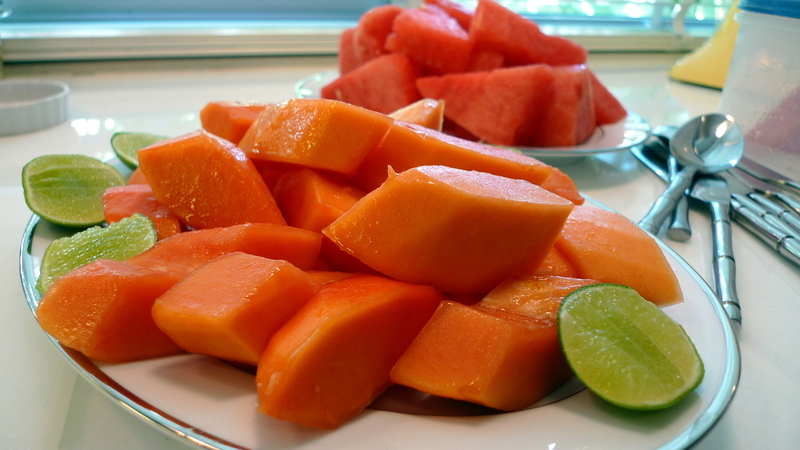 @Randy7777 – Yeah, the papaya in the tropics is much, much better. Mango, too. @smile4leena – @Fatcat723 – @nov_way – Glad you enjoyed the entry! @christao408 – 🙂 I’m excited. Now I have a reason to get married! my mouth watered right now. i want this 4-course meal. bad. how did i miss this? Oh well 🙂 Looks great. @Ikwa – Yeah, how *did* you miss it? Ha ha…@Devilzgaysianboi – You didn’t have a reason before? =P@rudyhou – Two words: come. visit. Nice brunch! Can I have the banana bread recipe please? I would love to try it!